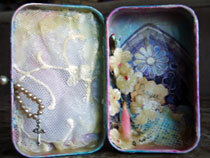 Altoid tin container by Janie Mills for display or to cradle a dearly loved rosary. 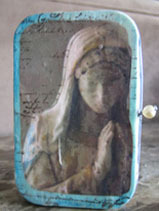 I love this depiction of a Madonna, a Mother, a Woman in quiet communication with her maker. Simple text with the word "Prayer" is added. A tiny pink candle lights the way. It was perfectly sized in it's partial use when taken out of an old box of birthday candles. I wonder what stories it could tell? 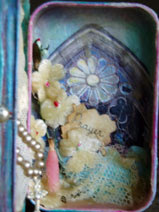 the image on the cover of mary is stunning and the tiny pearl such a sweet little opener to your shrine box! I love the symbolism that is present in all the details of this. My hands, with age, don't make tiny things very well anymore, but I sure love what you've made. It's a wonderful image. I would be proud to have it. Beautiful! She is gentle and i love shrine boxes, such wonder!